Imagine a world in great industrial revolution, a world filled with great machines powered only through steam and magic, a world of extraordinary heroes and vicious twisted villains, a world where Gentlemen are gentlemen and fine ladies are ladies. Naelvich is a world run entirely run on steam and magic. Over all we are a community of gamers interested in Pathfinder. We do however allow (with proper requesting and representation) converter 3.5 DND material to Pathfinder. We will mostly meet on The Black Star server. Characters and Character Creation - Please see the character creation page for instructions on how to make a proper starting character. Our current starting level is level 5 and we use the 34 point buy system in order to determine starting ability scores. We are a Roleplaying Community and encourage as much role play as we can. Before creating a character think about how they might fit into a setting such as this one. 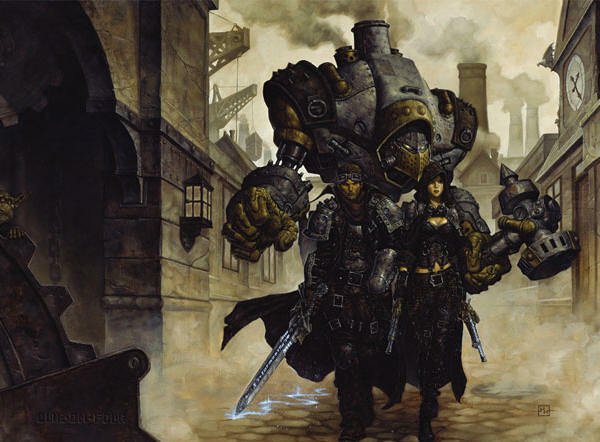 More Information on the actual setting could be read in the Campaign Setting section.